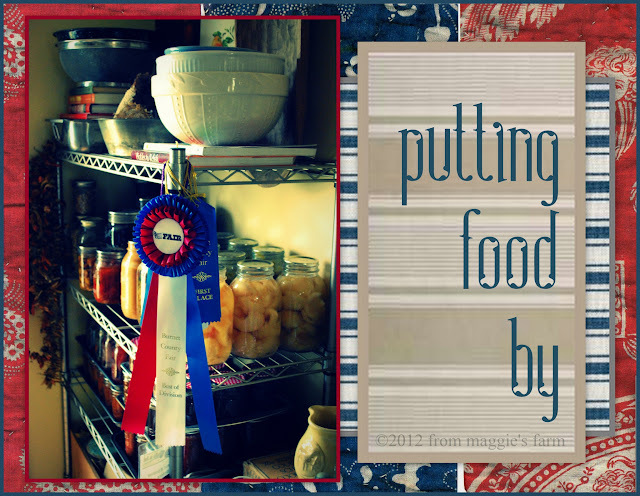 This week, sandwiched between Ball Canning's National Can It Forward Day, and Canning Across America's Can-A-Rama, we're all about putting food by on notes from maggie's farm. "Alexandra often said that if her mother were cast upon a desert island, she would thank God for her deliverance, make a garden, and find something to preserve. Preserving was almost a mania with Mrs. Bergson. Stout as she was, she roamed the scrubby banks of Norway Creek looking for fox grapes and goose plums, like a wild creature in search of prey. 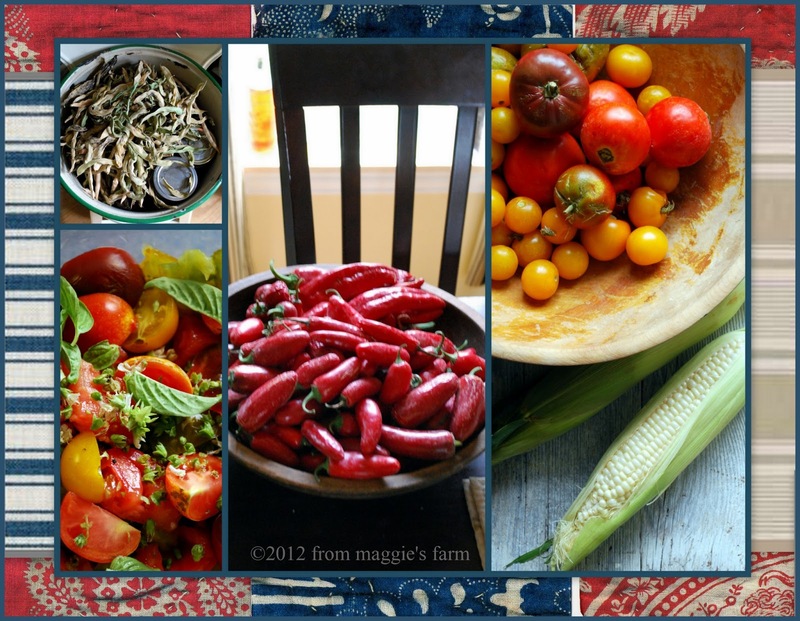 She made a yellow jam of the insipid ground cherries that grew on the prairie, flavoring it with lemon peel; and she made a sticky dark conserve of garden tomatoes. She had experimented even with the rank buffalo-pea, and she could not see a fine bronze cluster of them without shaking her head and murmuring, ‘What a pity!’ When there was nothing to preserve, she began to pickle." Willa Cather, O Pioneers! In the last few years, as our food supply has undergone scrutiny and our pocketbooks have undergone shrinkage, preserving the harvest of our own hard work in the garden, or the fruits of labor we gather from local farmers' markets, has experienced a resurgence in popularity. In addition to the practicality of the matter, we enjoy this link to the homespun craft of a simpler time, and in the depths of winter, delight in the reminder of the best days of our burgeoning gardens. As any gardener knows, it's feast or famine with our favorite berries, greens, tomatoes, cucumbers, and the like, and it all comes in like gangbusters. We eat as much as our tummies will allow, fresh from the vine, and with the abundance that's left, we save for those days upon which we'll pine for the precious treat of a preserved favorite crop. 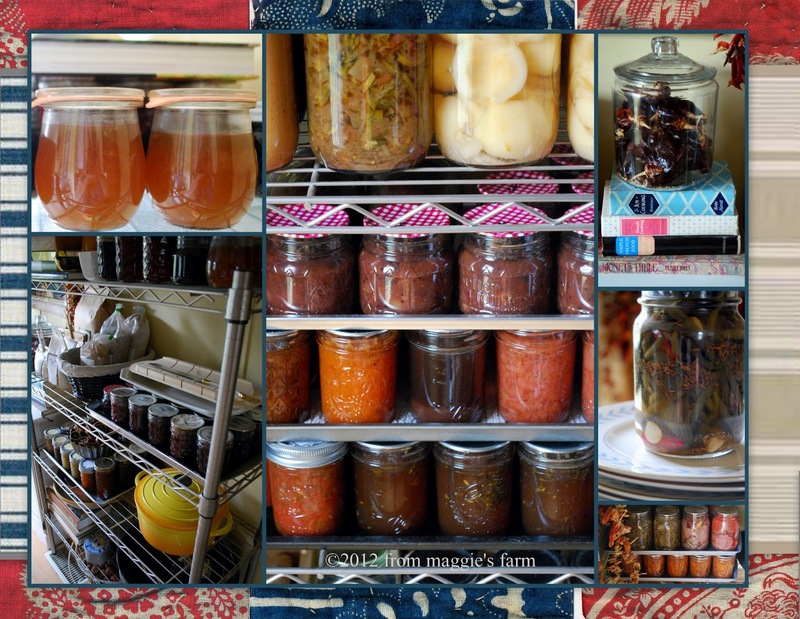 While we couldn't possibly fit all the preserving possibilities into one single week, we'll do our best to hit the high spots-- a few simple recipes you might like to tackle on your own, tips for safe food preservation, a pictorial on preservation, preserving by infusing liqueurs, and the basics of jamming, pickling, fermenting, and more. We'll start with a simple recipe for putting by what's possibly the easiest thing to grow in these scorching summer days in our region--peppers. We love pickles around here. Fermented deli-style garlic dills, bread and butter pickles, asian-style quick pickles, pickled this and pickled that, we love them all. 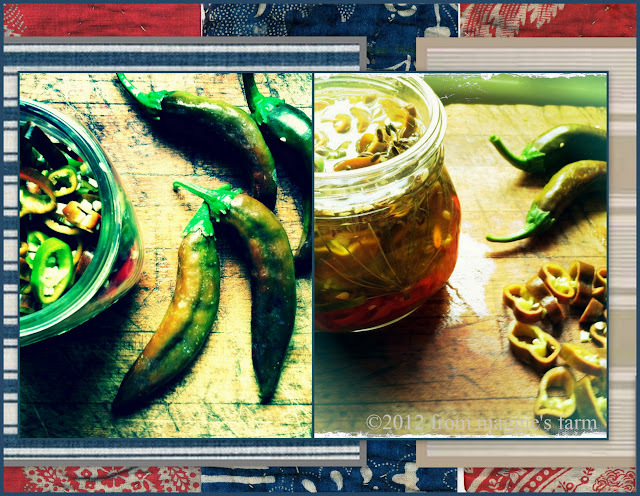 What we can't seem to keep in the house, however, is my husband's favorite-- pickled pepper rings. We eat them straight out of the can, as well as atop hot dogs, poboys, grinders, as a complement to our homemade cheeses.... heck, the sky's the limit! When you see how incredibly easy they are, you'll wonder, like we did, why you've been buying them from the market shelves all these years. Mild, medium, or hot; traditional banana peppers or any other favorite variety--these pretty little jars will be the 'most popular kids' of your own larder. 1/2 pound washed, dried, and sliced peppers--we've used mild and medium New Mexico Hatch chiles for this batch. Feel free to use your favorite mild, medium or hot peppers. Wash and sterilize (with boiling water, on in the top rack of a dishwasher) jar, lid, and ring of a pint-sized canning jar. Combine brine ingredients in a non-aluminum sauce pan. Bring to a simmer. Bring simmering brine to a full boil. Slowly pour over pepper rings in jar. Wipe rim of jar well, top with lid, and screw on ring. Bring to room temperature before refrigerating. Pepper rings will reach optimum flavor from 5-8 days. 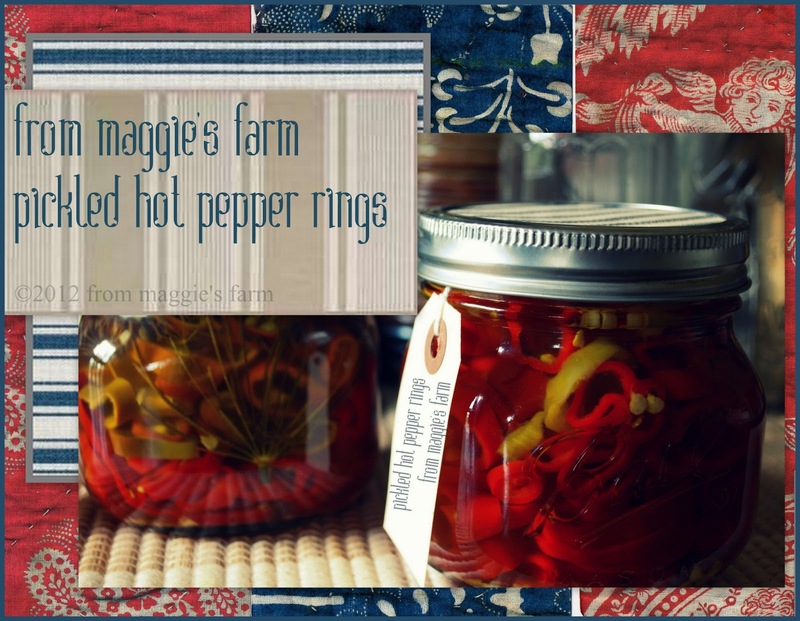 These pickled pepper rings will keep under refrigeration indefinitely. Should you wish to water-bath can these to allow for shelf-stability, they may be processed in boiling water for 10 minutes. More on water-bath canning on tomorrow's tips for tuesday: preservation basics. Salt preserves foods by creating a hostile environment for certain microorganisms. Within foods, salt brine dehydrates bacterial cells, alters osmotic pressure and inhibits bacterial growth and subsequent spoilage. Pickling is one of the oldest methods of preserving foods. Pickling is the preserving of food in an acid (usually vinegar), and it is this acid environment that prevents undesirable bacteria growth. For water-bath or pressure-canned pickling, foods are salted or soaked in brine first to draw out moisture that would dilute the acid that is added to 'pickle' the food. 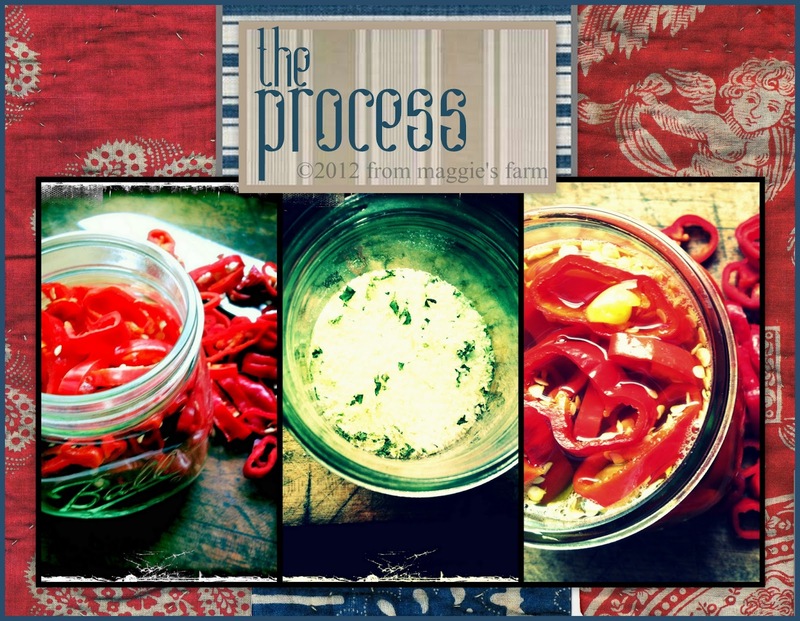 Learn more about safe food preservation tomorrow, on tips for tuesday: preservation basics at notes from maggie's farm. Every day is made a little better when pepper rings are available. I can't wait to dig in to the newest batch. Should be at it's best in about a week. Hang in there, sweets! I have never made pepper rings will have to try. It's funny my Aunt use to call it "putting up" instead of "Putting by" as a kid I use to think "putting up" meant putting up with all that canning by yourself. Hee hee I think I like "Putting by" better. Thanks for the love. I'm glad you are still using that salt. I can't wait to see what salts you make. I've called it both, but I think 'putting food by' even predates putting it up! I loved the 'putting up with all that canning by yourself'!! We love our salts! Thank you! I am growing peppers this year, and hope to try this if II am successful. I am wondering about tomatoes. I have a few plants growing this year (and see 30 tomatoes so far) and am wondering how best to store them? I am wondering if I should cook them down in some kind of sauce and freeze, or should I dry some in the oven? My hubby is allergic and it will only be me eating them. Any thoughts? Congrats on the 30 tomatoes! I think oven-drying would be the most simple way, and I LOVE eating them just like a snack, however a quick sauce would be useful. I also like to freeze mine. I have a post about that procedure: http://frommaggiesfarm.blogspot.com/2012/05/stocking-larder-preserving-by-freezing.html . Maybe that will help. Thank you for dropping by! Thank you so much! This is exciting to me. Off to check out your previous post! This has been a really bad year where I live for growing anything all summer. We have not had a drop of rain. Unfortunately despite all the watering, I am afraid none of my garden is going to produce anything. Maybe next year. This looks like a wonderful idea! I understand your discouragement. Last year's drought did us dirty just like that. Perhaps your local farmers market might be a good resource? They seemed to have better luck, last year, when I didn't! Thank you for dropping by! Always nice to see your smiling face. Canning jars are usually available in grocery stores around the vinegar--I find mine close to the pickles section. Another great resource is the local hardware store. These are my husband's favorite too! With a wedge of very sharp cheddar cheese he is in heaven. I am still trying to find the right variety to can though - he tried his hand at a batch and they turned out soooo hot that even for him they were over the top. I will look for the New Mexico Hatch around here and see what I can come up with. Thank you for such a great post. Thanks for dropping by! The most commonly used pepper for these rings is the Hungarian Wax Pepper, or banana peppers, which you can get in 'mild' versions. You may find them to be a milder version, even, than the Hatch chiles. Let me know how they turn out!